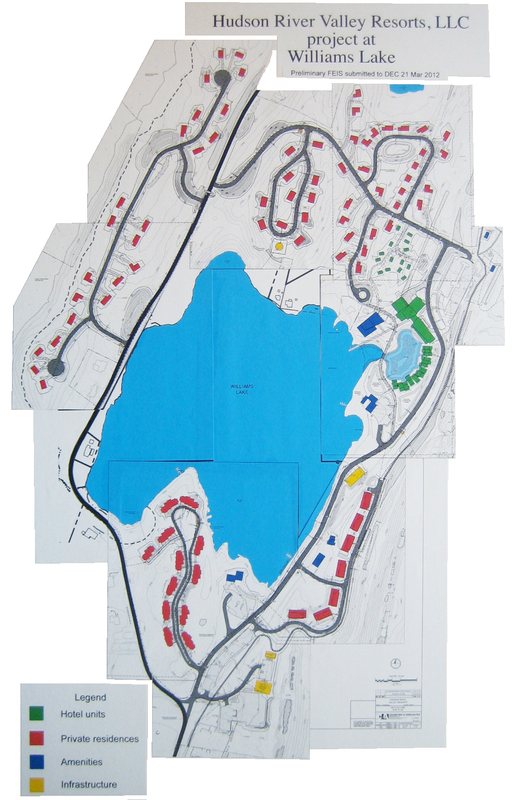 These pages represent a collection of data on subjects related to the proposed development at Williams Lake1, Rosendale, NY. Most of the data results from attendance at Town meetings, public documents (mainly obtained via the FOIL process), and a literature search conducted on the internet. Where they appear, opinions and conclusions are exclusively those of the author, Christopher Beall, and may or may not represent the opinions and conclusions of Save The Lakes. This is detailed background information. For a general overview of the proposed development and the issues it raises, you may prefer to visit the Save The Lakes website. Table of Contents, List of Consultants, Acronyms, List of Appendices (141 Kb) - 20 pages. Draft Environmental Impact Statement REPORT (26 Mb) - 650 pages. Draft Environmental Impact Statement APPENDICES (506 Mb) - 7000 pages. Public comments on the DEIS. Comments on rerouting of the Rail trail. HRVR sent to DEC a proposed Final Environmental Impact Statement (FEIS) on 21 Mar 2012 for acceptance, but it was not generally released, although an electronic copy is available at the Rosendale Library. This preliminary FEIS responded to comments on the DEIS, but does not replace that document It describes a slightly reduced project, as shown in a revised conceptual site plan. List of project size changes. Save The Lakes comments on the preliminary FEIS, including the BLCPDA zoning amendment. DEC comments on the preliminary FEIS. A Final Environmental Impact Statement (FEIS) was accepted by DEC on 15 May 2013. Like the preliminary version it responds to comments on the DEIS, as well as many comments from DEC and the Town on the preliminary FEIS; comments from the general public were acknowledged, but the SEQRA process does not require that they receive a response. Project conflicts with current zoning. To address these conflicts, HRVR proposed an amendment to Town zoning law. On 2 Oct 2013, after several review cycles and revisions, the Town Board approved this amendment as the Binnewater Lakes Conservation Planned Development Area (BLCPDA). Spa resort employment and Rosendale residents. Spa resort trade organizations and publications. State Environmental Quality Review (SEQR). Timeline of official actions regarding the project. Williams Lake is also known as Fifth Binnewater or sometimes just Fifth Lake. Last updated 16 Oct 2013.